Art and games are both forms of ritualized human creativity. When Marcel Duchamp gave up the former to pursue the latter, he famously said ”I have come to the personal conclusion that while all artists are not chess players, all chess players are artists.” The interface between art and games is especially provocative for many artists whose imaginations were shaped by the 1974 publication of Dungeons & Dragons, which founded a uniquely free-form and collaborative genre of role-playing games. 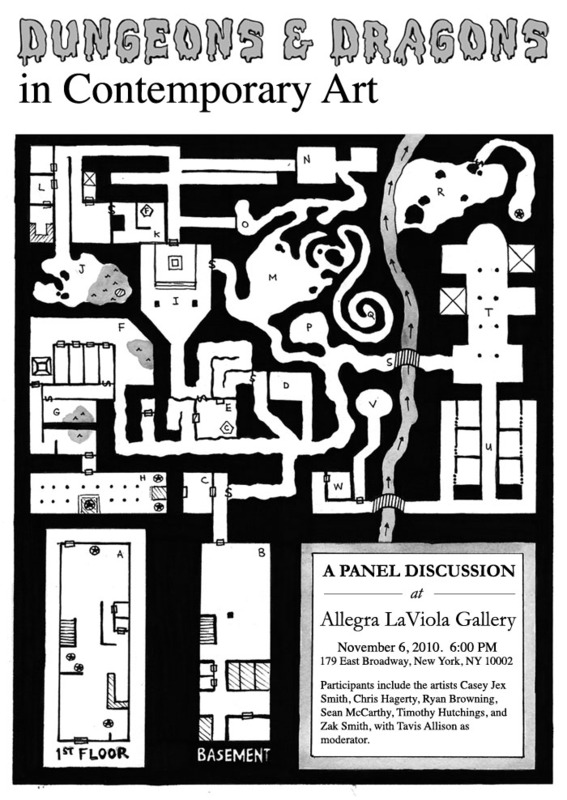 This panel brings together contemporary artists who play within the realm of role playing games. Using these games as more than a vehicle for nostalgic posturing, these artists critically engage RPGs as tools for creative intervention, criticism, and shared experience. I will be moderating the conversation and taking questions from the audience – if you can’t make it, post your questions here; I’ll ask them for you and post the reply, although I believe video of the panel will be available as well – certainly, some great videos of the Doomslangers opening ceremonies can be seen on the gallery website. Here is my plea to please, please video the event. Even if someone simply places a Flip camera on the side of the room… I really want to hear what this group has to say, but am traveling over the weekend and cannot make it. Very cool, Tavis. That flyer is awesome. I second the request for a video! holy crapfest. i’m officially there. I’ve totally played this dungeon. It was cool. I like how you have to ride the river down to get to area ‘R’, and then figure how to get back.